20 seconds ago... Casey: This is MY Pikachu! 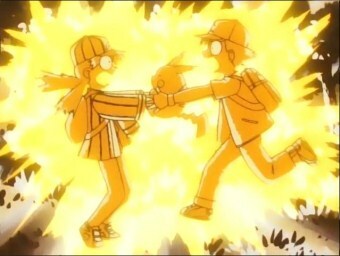 Ash: No, it's MY Pikachu! Casey: I said it's my Pikachu! Ash: No way! It's MINE Pikachu: Pika... CHUUUUUU!!!!! Ash: He is clearly saying that he likes me better! by E.K.A.N.S. Ash: Oh Arceus! I'M FLYING!!! Casey: *Gasp* Sorcery! by E.K.A.N.S. Pikachu used Thunderbolt. Ash has Levitate. It had no effect. by E.K.A.N.S. Pikachu: THIS IS WHAT YOU GET FOR ALL THOSE BAD "SHOCK" PUNS by E.K.A.N.S. Clemont: For once a failed experiment that doesn't explode in MY face! by E.K.A.N.S. Clemont: I told ya: SCIENCE! by E.K.A.N.S. The future is now thanks to THUNDERBOLTS by E.K.A.N.S.